Housed in the 17th Palazzo Gori Pannilini, this five star hotel has been patronised by numerous members of the European nobility, including Queen Margaret of Savoy. Moreover, the structure itself was built by the Chigi Pope Alexander VII as a marriage gift to his niece. Once frequented by young gentlemen on their Grand Tour during the early 19th century, this five star establishment boasts some impressive frescoes and plenty of classic Italian marble. 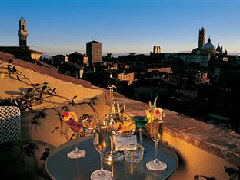 It offers over 50 rooms and suites, a bar, and a noted restaurant specialising in Tuscan cuisine, The SaporDivino.